We recently had the chance to try out a few bags of Farm Rich products. 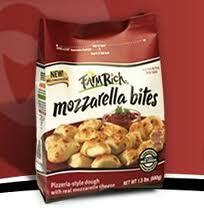 "Farm Rich® products have been setting the standard for delicious, easy-to-prepare food the whole family loves. Farm Rich® foods taste like nothing else because they're made like nothing else – with 100% real ingredients like real cheese, high-quality meats and fresh vegetables. Our snacks, appetizers, and breakfast foods are quick-frozen and carefully packaged so busy families can prepare great tasting food within minutes. From early morning breakfasts to midnight snacks, we're proud to say Farm Rich® products have become synonymous with high quality and great taste." What we thought: Farm Rich has a variety of snacks including Mini Quesadillas, Mini Philly Cheese Steaks and Fried Mushrooms, however our store only carried Mozzarella Bites and Cheese Sticks. The cheese bites are chunks of mozzarella wrapped in bread dough…super tasty and filling and great dipped in marinara! The sticks baked up nice and crispy and were also delicious with marinara. These were really yummy snacks and hopefully soon our grocer will add a few more Farm Rich varieties to our freezer sectionJ These tasty treats would be great as afternoon or midnight snacks, appetizers or party trays. ABCD Diaries gives Farm Rich an A+! Buy It: Find these yummy snacks at a grocer near you with the store locator! Disclosure: ABCD Diaries was given two free product coupons for review purposes only. We were in no other way compensated. The opinions expressed in this post are ours and ours alone.